Sadly not a Bad Lieutenant: Port of Call New Orleans (2009, Werner Herzog) style reworking with the premise of an earlier film turned into something strange and new, this flashy remake moves the action from Copenhagen to London and mimics the style and plot of Nicolas Winding Refn‘s debut Pusher (1996, ) but fails to capture its emotional intensity. 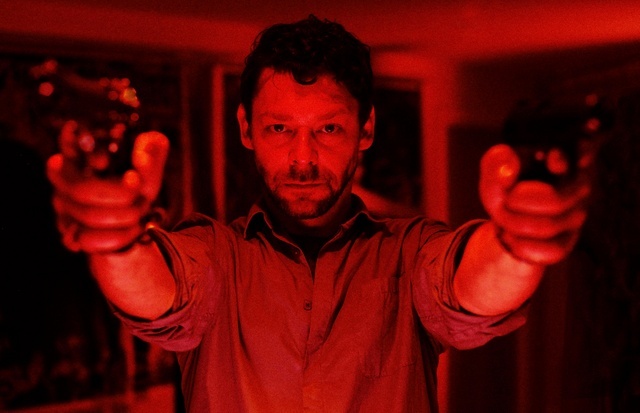 Frank (Richard Coyle) botches a drug deal after getting lifted by the police while carrying gear borrowed from amiable gangster Milo (once again played by Zlatko Burić who appeared in all three of Refn’s Pusher movies). While comparisons are inevitable Luis Prieto’s film remains watchable enough thanks to a charismatic turn from former Coupling star Coyle cast against type and the strength of Refn’s narrative which still grips from the moment Frank finds himself in trouble. There is plenty of gangster movie posturing in Refn’s movie but there was a sense these people had inner lives; that they existed outside the clichés of the genre. In one memorable sequence the towering Serbian enforcer Radovan (Slavko Labovic) spoke of his dream of retiring from a life of ripping out kneecaps and opening a restaurant. Most of the characters seemed trapped by their circumstances be it poverty or their involvement in crime. Moments of reflection are skimmed over in the remake. There is a hamfisted attempt at conveying the human cost of Frank’s trade with a harmless old shopkeeper being leaned on a little too heavily but when Prieto cuts to a close-up of a dog sadly observing the aftermath the effect is anything but subtle. You could understand why Kim Bodnia’s Frank worked with Tonny (Mads Mikkelsen). These two seemed like friends and Frank was a thug, smarter than Tonny but not by much. Coyle’s Frank is more intelligent and would surely figure Tony (Bronson Webb) for a liability long before he lands him in it. While Coyle and Burić are effective the rest of the cast act like they are in an episode of The Bill. Agyness Deyn looks far too healthy for a woman who is supposed to be hooked on drugs and desperate to escape from her destructive lifestyle. Pusher 2012 is an interesting film to watch for long-time admirers of Refn, though a new entry in the series would have been preferable. The film is worth seeing however for Coyle, the impressive neon-tinged visuals by cinematographer Simon Dennis, and the score by Orbital.